There are few places in the wine world that can be as uninspiring as a barrel cellar; let’s face it, the barrel cellar is the purgatory of the winery – too far removed from the vineyard to have a connection with the land but yet still not close enough to the moment when the wine can finally be enjoyed – here the wine sits in limbo, snuggled beneath its duvet of oak, steel or terracotta, depending on what you are having yourself, as they would say in rural Ireland. 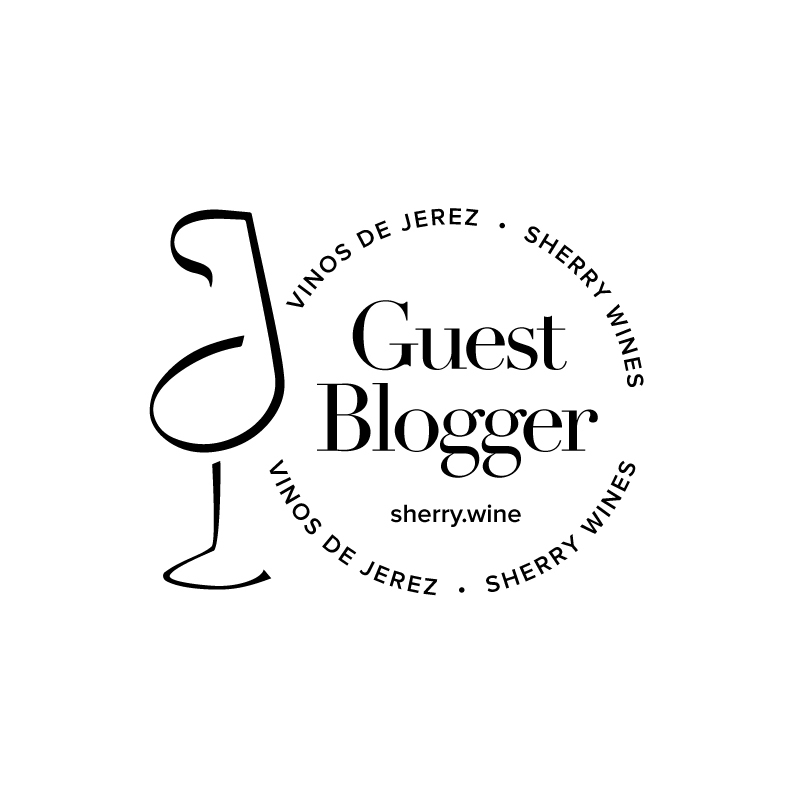 Unless you view the barrels are part of the terroir, and I’ve read many meritorious commentaries on this very topic for sherry in particular, there is very little excitement that can be drummed up over a collection of oak barrels – the cellar either has soul or it doesn’t. That’s what set the barrel cellars at Montevertine apart from any other that I’ve visited before. There was something quite magical about them and my abiding thought after the visit was that if I ever fell out of love with wine, a trip back here would surely rekindle the flame. 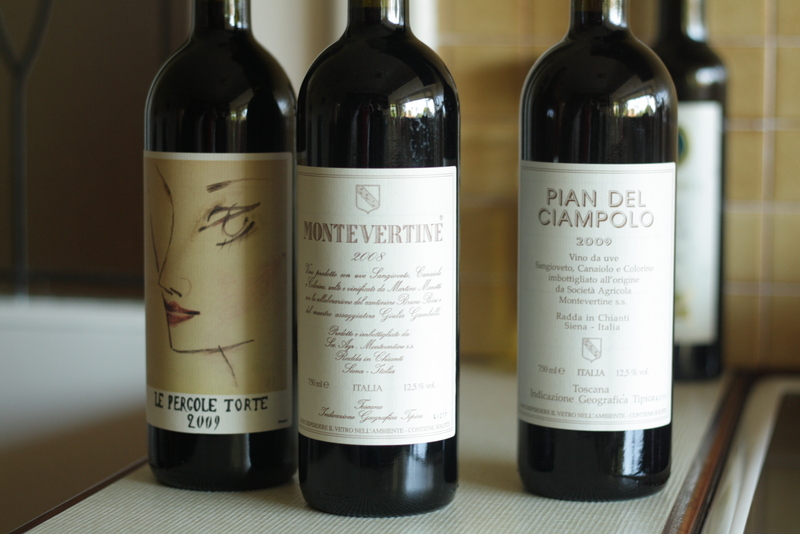 Montevertine’s story and its place in the history of Chianti Classico, and indeed Sangiovese, is well documented. Having withdrawn from the Chianti Classico DOC in the early 80s, despite being one of the premier estates in the commune of Radda in Chianti, Montevertine bottles its wines as Indicazione Geografica Tipica (IGT) including its flagship offering Le Pergole Torte. The battleground in the 80s, as it remains so often now, centred on grape varieties. The late Sergio Manetti wanted to make a wine solely of Sangiovese, an option not available to him at time under Chianti Classico Consorzio rules. It’s a philosophy that has been carried on by his son Martino to the present day despite many other estates in the area rushing to plant more Cabernet Sauvignon and Merlot. Nearly everything in Montevertine is old – and it starts with the vineyards. The Pergole Torte vineyard was planted in 1968 and the vines in some of the other vineyards have now entered their fourth decade. Montevertine’s entry wine “Pian Del Ciampolo” and its next level brother “Montevertine” are made from Sangioveto (Sangiovese), Canaiolo and Colorino. Le Pergole Torte on the other hand is Sangiovese in purezza and a representation of the estate’s best fruit. Although named after different vineyards on the 18ha property, the three wines are no longer strictly single vineyard crus but rather selections of fruit from across the estate. Despite the road appearing at first to descend from Radda, the vineyards at Montevertine are at an elevation of approximately 450m with a cooler microclimate than other vineyards in the area. 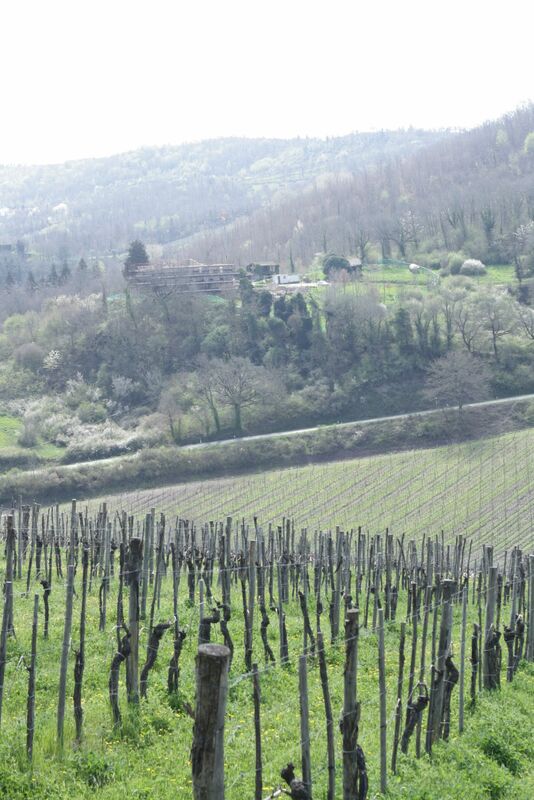 This relatively high elevation for growing Sangiovese means that harvest usually starts in the first half of October. As with elsewhere in Chianti Classico (the place), the soil here is predominantly a mix of galestro and alberese, but to delve into the geology no further would mean overlooking the iron rich soil in the Pergole Torte vineyard that leaves a reddish tinge in the ground and confers an added mineral complexity to the wine. 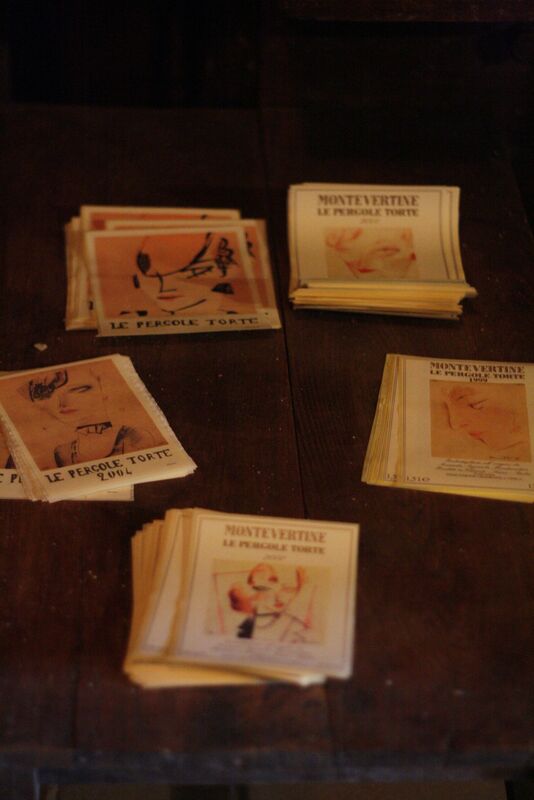 I could wax lyrical for paragraphs and paragraphs about the vineyards, but to do so would merely regurgitate the articles of many other visitors to Montevertine and more importantly would ignore the true joy of the visit – the cantina. Upon entering the cantina, Stefano, a cellar worker and our guide for the day, turned on the lights with the sort of hissing of bulbs than wouldn’t be out of place in warehouse scene in a gangster movie. Montevertine’s three red wines are all fermented in fibreglass-lined cement vats without temperature control and these vats are the first things you are faced with once your eyes adjust to a room where the reflection of stainless steel is conspicuous by its absence. Indeed the only reflective light bounces off the glossy London bus coloured vats that line the walls around you. Following fermentation, the wines are transferred to oak barrels of varying sizes where they remain for 12 months in the case of Pian del Ciampolo and 18 months in the case of Montevertine. Le Pergole Torte on the other hand spends 12 months in barrique with a further 12 months in 10HL barrels. Some of the oak barrels are stored in an annex off the fermentation room and it’s here you really get a sense that you are standing in a former stable, each stall now filled with barrels of slowly ageing wine. Above each barrel hangs a chalk sign identifying the contents using a coding system employed at Montevertine for decades. Despite snapping with a frequency that Mario Testino would have been proud of, the dusky light that added so much to the atmosphere in person yielded nothing but macabre visuals in film. Something tells me that’s the way the Manetti’s might want to keep it – these memories must remain ingrained in one’s mind rather than on an iPhone. We did an about-face and as we walked back past the cement vats toward yet more oak barrels, I noted a closure mechanism that I had not come across on my travels previously. Keen to minimise the interaction of the wines with metal means that the traditional stainless steel door closures aren’t adequate for the barrels at Montevertine. 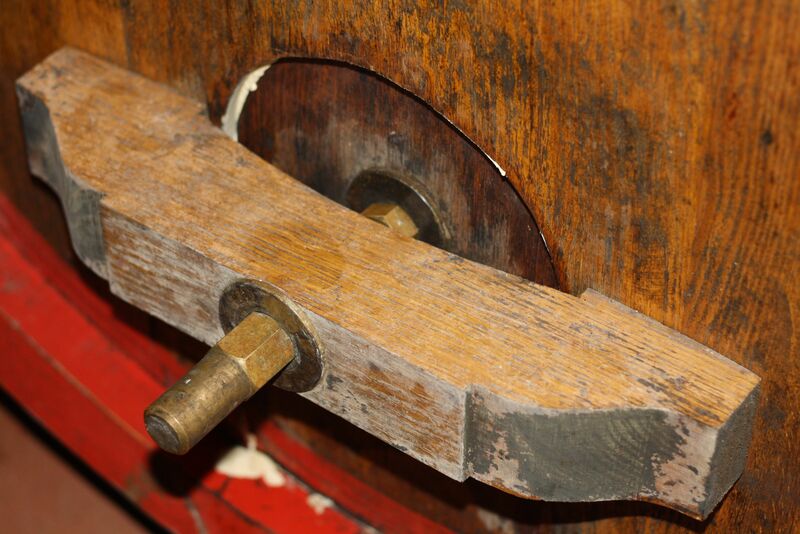 Instead a wooden contraption (see above), looking more like a relic from an age since past, is employed to close the barrels. Cumbersome and time-consuming to maintain and install, but certainly effective, to me this merely exemplified the lengths that the team at Montevertine will go to in an effort to produce such fine wines. At the end of the walkway lay a stairs leading to the barrique cellar below. My 6 foot 3 frame gingerly descended, the metallic spiral staircase swaying as a I transferred my weight from step to step. Stepping off the bottom step into a room of 81 barriques containing the 2012 vintage of Le Pergole Torte, the first thing that hit me was the cool air – an encouraging sign in a region that receives constant criticism for elevated cellar temperatures. Stefano explained that this was not the work of a sophisticated air conditioning unit but instead of mother nature – the most prominent wall in the cellar is north facing which provides a cooling effect to the entire room. The barriques themselves are a mix of old and new Allier oak; they are generally used for no more than five years with only a small portion being replaced each year to minimise the influence of new wood. As was the case with the larger oak barrels above however, the standard closure mechanisms employed in other wineries do not meet Montevertine’s exacting standards. 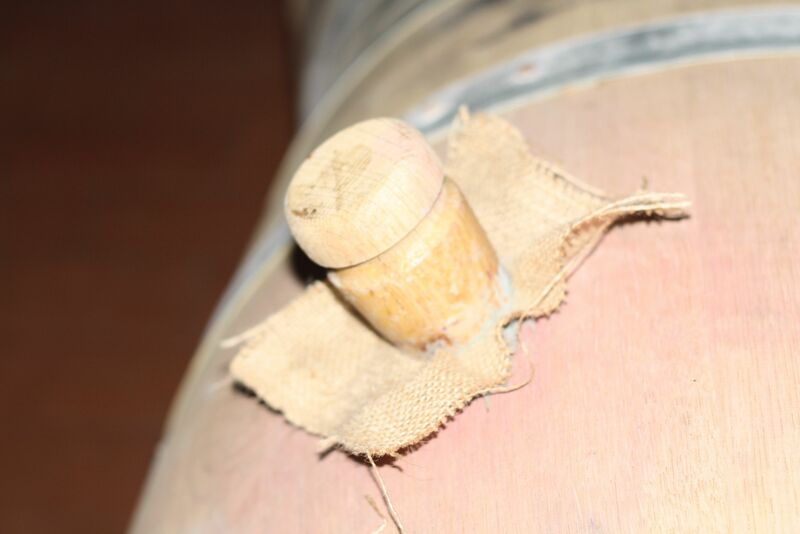 In this case, the barriques are filled within centimetres of the top and then closed with a wooden plug wrapped in a hession cloth. Stefano assured me that one strong and decisive blow of the hammer is enough to perfectly seal the barrel – the hession is there to stop the barrel splitting as it expands. After a few weeks, the barriques are then tipped 5 degrees to their side, thus dissipating the bubble of oxygen that had been lying beneath the plug throughout the rest of the wine in the barrel. The wine is still micro oxygenated through the porous wood but as there is less exposure to air than would normally be expected when using a standard barrique closure, Le Pergole Torte can sometimes show some reductive characteristics when first opened. I started off by saying that there was something quite magical about the cellars and cantina at Montevertine and that if I ever fell out of love with wine, a trip back here would surely rekindle the flame. That’s the way I really feel – every little detail in the winemaking process at Montevertine has been carefully considered. The atmosphere throughout the winery is so staunchly traditional that it adds an air of romanticism to the entire experience – indeed so much so that one could easily forget about the wines and how good they are. The wines of Montevertine are absolutely delicious. At the top level they are elegant, pure and graceful yet also intense and structured. 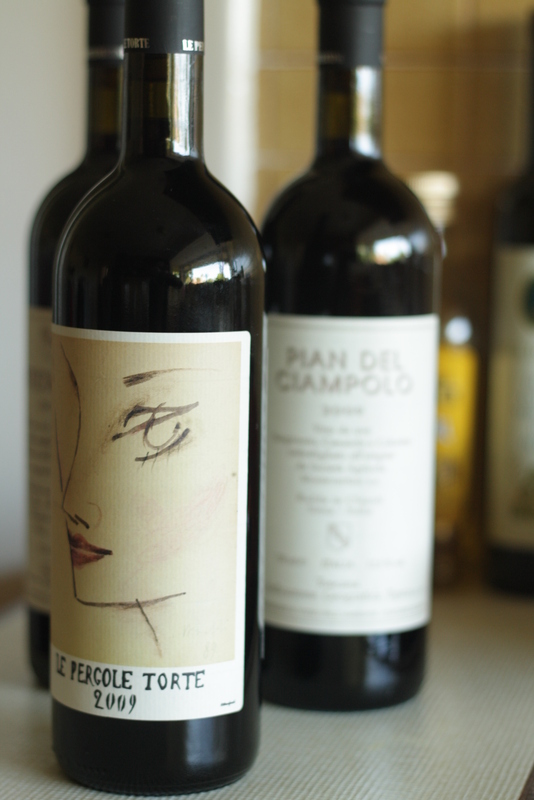 The oft overlooked Pian Del Ciampolo has become a real personal favourite of mine – its lightish colour in the glass combined with its floral aromas and rustic acidity are what Tuscan wine is (should be) about and it’s streets ahead of most all Chianti Classicos at a similar price. Montevertine’s wines are imported into Ireland by Grapecircus at Sheridans Cheesemongers.